For an evening of fun with a mate or a date, we have the top picks in Oxfordshire for you. Get booking soon, these events will sell out fast! ‘Putter Ring On It’: Absolut vanilla, martini rosso, bubble gum, vimto, lemonade. ‘Drank u, next’: Pink beefeater gin, lemon, elderflower, strawberry puree, strawberry vimto, lemonade. Boyfriend or girlfriend 100% optional. 14 February, normal open hours, regular price. Hope you’ve probably already had your scariest Valentine’s date? Think again. Experience a genuinely scary evening at Oxford Castle & Prison, where you will be regaled with haunting love stories whilst drinking chilled prosecco, followed by a spooky tour of the site in search of the scary spirits, arm-in-arm with your Valentine’s date! 13 February, 7pm, £25. (Includes event, tour and a glass of fizz). Enjoy a romantic meal from inside Oxford’s 1,000 year old castle and prison. While seated inside your own private cell, you’ll be served a delicious three course meal. A date in truly intimate and unique surroundings. 14 February, 6:30pm or 9pm, from £80. 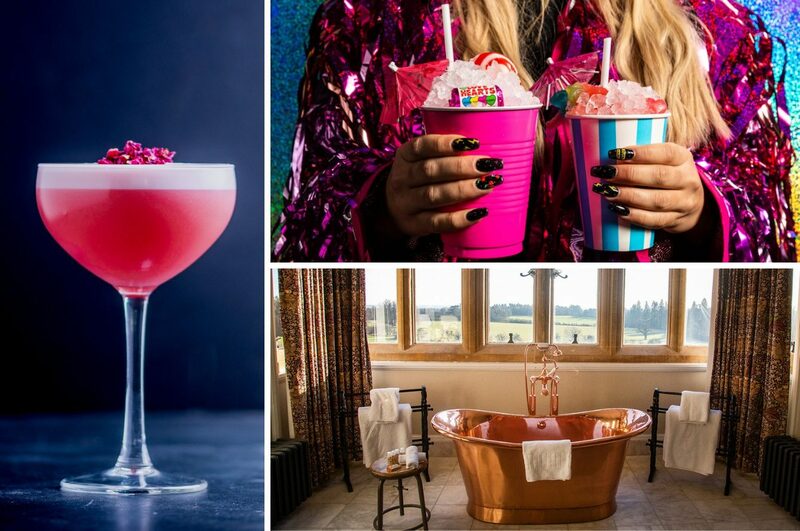 We can think of few places more romantic than stunning Eynsham Hall, so we are delighted that they are offering two Valentine’s deals this year. Whisk your loved one away for a romantic stay at Eynsham Hall for Valentine’s. PLUS they have opened this offer for the whole of February, not just Valentine’s night! 1 – 28 February, £199 a room (based on two adults). 20% off afternoon tea for 1 week only. Opt for Champagne afternoon tea and they will serve you Pink Champagne! Celebrate Valentine’s at NYC-inspired comfort food and cocktail concept Dirty Bones Oxford in Westgate’s roof terrace. This Valentines, Dirty Bones will introduce the Rose-Tinted Club, a cocktail special for both the lovers and the haters. A Dirty Bones riff on the classic Clover Club cocktail, the Rose-Tinted Club blends a house-made Raspberry & Rose Petal Shrub with Aperol, Tanqueray gin, lemon juice, egg white and simple syrup. Indulge your optimism and sentiment this Valentines with the Rose-Tinted Club but don’t be seduced by the pretty-in- pink hue, this drink has got sass and depth. The Rose-Tinted Club Valentines Special is available 11 – 17 February at Dirty Bones Oxford. On Wednesday 13 February, the bar at Dirty Bones Oxford will play cupid to the Uh Huh Honey Cocktail Masterclass. Join the cocktail aficionados from Diageo and their Group Head of Bars (top mixologist and all-round cocktail guru) for a how-to on mixing and shaking your way into your date’s (or mate’s) good books. Learn how to craft the Dirty Bones Valentines Special, the Rose-Tinted Club, with Tanqueray Gin, and the perfect Old Fashioned, with Bulleit Bourbon. Tickets to the masterclass are priced at £20 person and availability is limited. On Valentine’s Day itself, tables of two who have booked in advance for dinner can bring their BFF or bae through for a complimentary glass of fizz courtesy of Dirty Bones Oxford. 11-17 February, normal opening times. Treat your loved one to a romantic city stay. The Royal Oxford Hotel, in central Oxford, has organised a special Valentine’s Weekend offer. A beautiful room, including English & Continental breakfast, a box of chocolates and a bottle of Prosecco, all for only £250. Minimum 2 nights stay. How about joining Hook Norton Brewery for dinner? The Brewery will be celebrating the most romantic night of the year by serving a delicious three course meal in their Malthouse. This is not a night to be missed. The Manor Country House Hotel will be hosting a lavish celebration of love in the Oxfordshire countryside this February. Show that special someone how much they mean to you with a decadent tasting menu including freshly shucked oysters, sous-vide fillet of beef and rich chocolate fondant with honeycomb ice-cream (among other dishes!). 14 + 16 February, 6:30pm to 9pm, £65. Happy romancing! Snap your Valentines experiences and share with us on social media by tagging #ExperienceOx to share the love!